Sexes similar. Adult has pale head, chestnut body, tail and upper wings. Wing tips black with white patches under wing. Tail deeply forked. 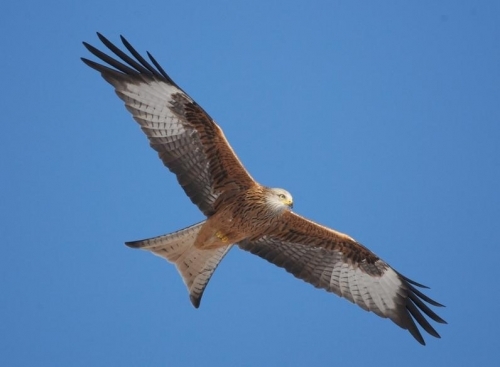 The Red Kite’s striking colours, distinctive shape and graceful flight make it easily an easily recognisable bird. It’s name comes from the fact that the body and inner wings are a deep reddish brown colour. The body colour contrasts strongly with the black and white wing tips and grey head of an adult Kite. In flight the Kites long wings (1.6-1.8m wingspan) and tail are very apparent. The tail, which is also a deep red, is deeply forked separating it clearly from all other Irish birds of prey. The Kite is a very graceful flier, soaring for long periods but also capable of quick acrobatic flight.